Call for Youth Report Researchers, Authors and Peer Reviewers! 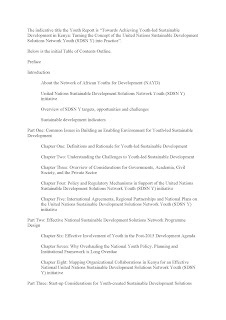 The Network of African Youths for Development (NAYD) has become one of the strongest voices of young people in Africa and is now pleased to open up a call for applications to interested persons and institutions willing to collaborate in developing a youth report seeking to investigate how to operationalize the United Nations Sustainable Development Solutions Network Youth (SDSN Y) programme in sub-Saharan Africa – starting in Kenya. 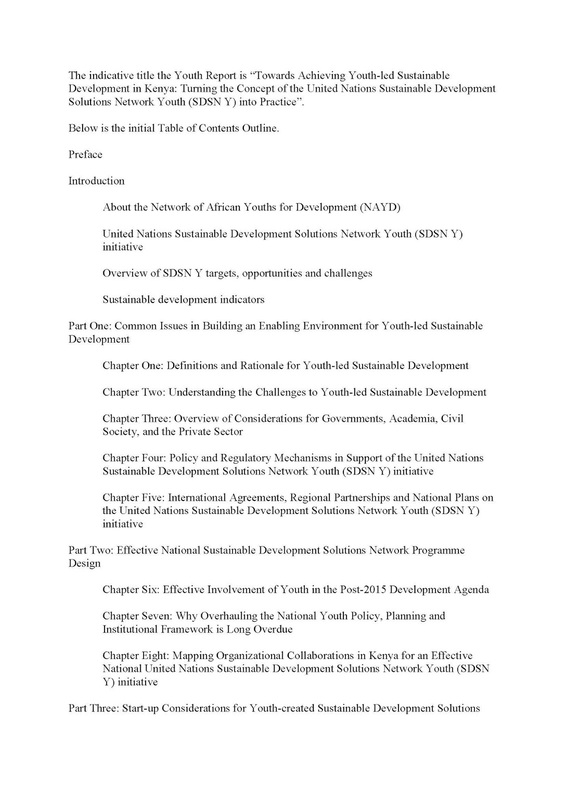 SDSN Y is the global youth initiative of the United Nations Sustainable Development Solutions Network (SDSN) driven and led by youth leaders from around the world. SDSN-Y will engage youth in the education and implementation of the Sustainable Development Goals (SDGs), to be adopted by the United Nation (UN) member states this September and is already active in several countries in Europe, Australia, and the Americas, and expanding at a rapid pace. The positions are open to all those individuals with demonstrated interest in youth development issues particularly in a developing country context, and who would be able to dedicate at least 20 hours per week to this assignment starting in early or mid-October. Applicants must be currently residing in Kenya and be willing to help develop this report over a three month period. We also seek institutional partners active in youth development matters to support this initiative whether in cash or in kind. E-mail addresses: Nericmwangi@yahoo.com and Tdobermann@gmail.com; with a copy to Paul@geovision.co.uk; Sslon2@student.monash.edu and Annetjudy@yahoo.com. Please title your email ‘Clarification – NAYD-SDSN Y Youth Report’. Please direct all inquiries about NAYD to Help@nayd.org and about SDSN-Youth to Youth@unsdsn.org. How to apply: fill out this form and to view the curriculum of the planned Youth Report, please see the images at the bottom of this advertisement. We'll be in touch in the next few weeks with a follow-up. Good luck! NAYD and SDSN Y have no obligation to provide clarifications to questions received after the said date. Replies will be given no later than 11 days before the deadline for submission of applications. To ensure equal treatment of applicants, the NAYD and SDSN-Y cannot give a prior opinion on the eligibility of applicants, affiliated entity(ies), an action or specific activities. 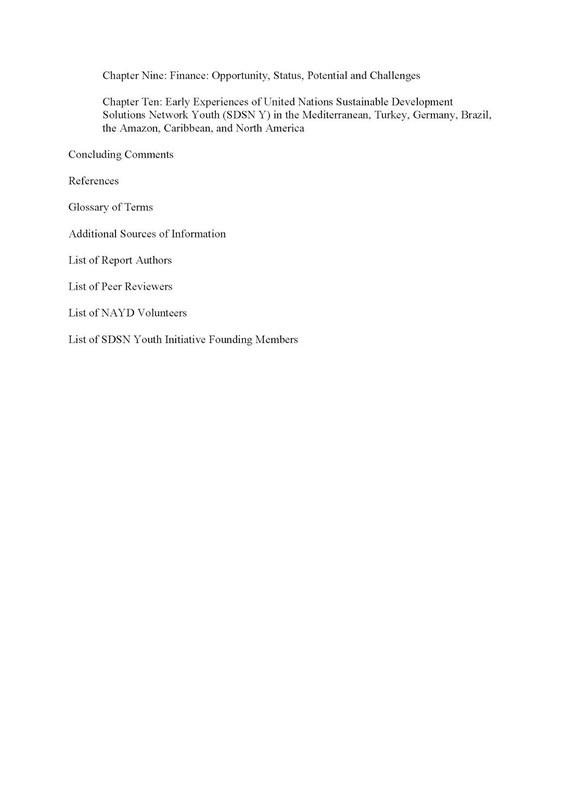 Questions that may be relevant to other applicants, together with answers and other important notices in the course of the evaluation procedure, will be published on the NAYD website http://www.nayd.org/ and on the SDSN-Y website http://www.sdsnyouth.org/, as the need arises. It is therefore advisable to consult the above mentioned websites regularly in order to be informed of the questions and answers published. This process does not and shall not discriminate on the basis of race, color, religion (creed), gender, gender expression, age, national origin (ancestry), disability, marital status, sexual orientation, or military status. Consideration will be given to those with physical disabilities and women to ensure parity within the candidate pool. Applicants selected on the basis of this call will be invited to commence the engagement as stated if sufficient funding has been secured. Disclaimer: The NAYD-SDSN Youth partnership reserves the right to contract personnel outside the pool of applicants if this is deemed necessary.